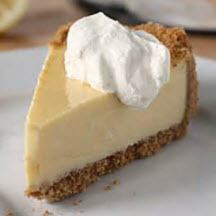 This old-time lemon cream ice box pie is sure to become a new favorite pie with your family. Gild this lily of a pie with a dollop of sweetened whipped cream! In a medium bowl combine condensed milk, lemon juice, lemon zest and egg yolks; mix well. Pour into pie crust and refrigerate until firm, about 1 hour. Meanwhile, beat egg whites with an electric mixer on medium speed until soft peaks form. Beat in sugar, 1 tablespoon at a time, and continue beating until stiff peaks form. Remove pie from refrigerator and top with beaten egg whites, spreading to the edge of the crust to seal. Bake until just browned, about 12 minutes. Keep refrigerated until ready to serve.